On final landed short of runway into grass, gear collapsed. 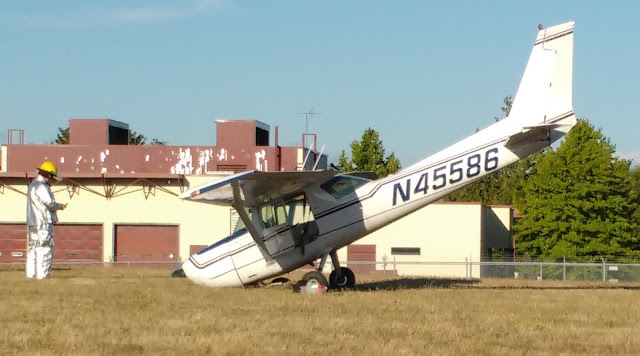 A pilot walked away without injury after reporting engine problems and making a hard landing short of the small runway at Paine Field in Everett Saturday evening. Scott North with Paine Field passed along what they know so far. No one was injured Saturday when a small plane landed hard at the shorter of two runways at Paine Field. The 6:49 p.m. mishap involved a Cessna 150M owned by a flying business at the Snohomish County airport. The pilot, the sole occupant, reported engine trouble. Runway 34R-16L, which is on the airport’s east side, was closed while the damaged plane was removed. The Paine Field Fire Department and airport operations crews responded to the scene. Editor’s note: This is not the same runway described in our earlier story today regarding a resurfacing project that will need a re-do.